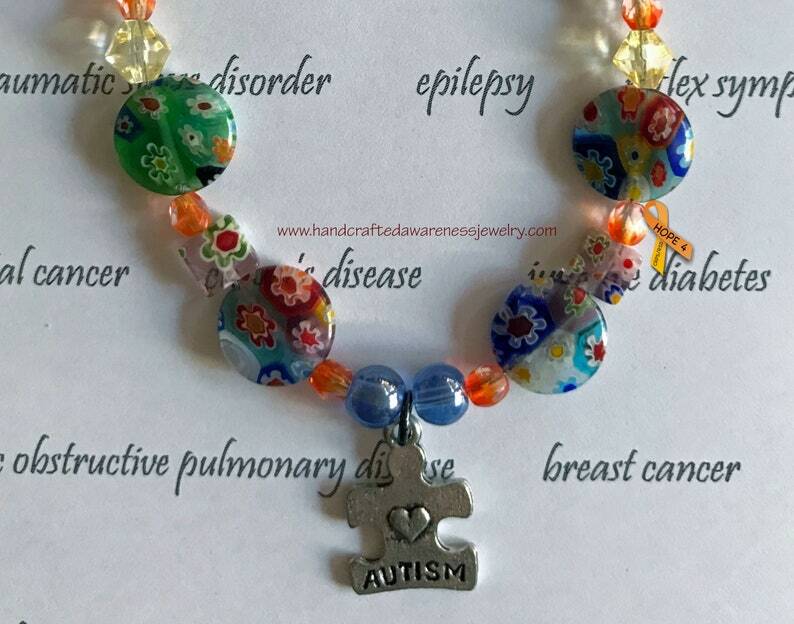 This Autism and Asperger Syndrome Awareness Bracelet comes in multiple colored Millefiori beads, shapes and sizes with an Autism Puzzle Charm. It has a little bit of sparkle while in the sun or light. 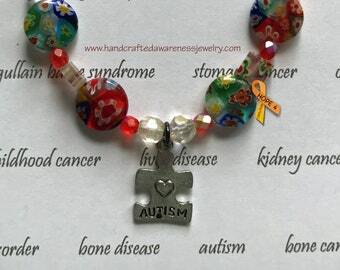 Why not spread your awareness for Autism and Asperger's' Syndrome with this bracelet. I enjoy working with you the customer on personalizing a design. Most of my designs can be customized to meet your needs by using different colors, stones, beads, leather and charms that I have in stock. A $20.00 non-refundable deposit to start a customized order is required. I will photograph and do 3 changes only to the design you have requested. Once you choose from those, what you are wanting, full payment is expected before your order is completed. You are responsible for correct sizing for your jewelry request. Bracelets are made between .25"-.50" larger if you give wrist measurement vs a bracelet length that you want. Please ask if you have any other questions about personalizing an order. ~18" Princess length, at collarbone. Measure your favorite necklace to find the length you like to wear. Wrap a flexible measuring tape or piece of string around your wrist right above the bone. If using string, mark it where the end meets then measure it with a ruler. 2. Measure your favorite bracelet to find the length you like to wear. You are responsible for ordering correct sizing. These are general guidelines that I recommend to help keep your jewelry staying and looking nice for a long time. ~Remove your jewelry before showering or bathing. Soap scum will build up on your jewelry and in time make it dull and dingy. ~Never wear your jewelry in chlorinated water. Chlorine interacts with metals and can ruin your jewelry piece very quickly. ~Jewelry polishing cloths work well to clean all jewelry. Using a paper towel or tissue can scratch your jewelry. ~Store your jewelry in an airtight bag or using an anti-tarnish strip as this will reduce the chance for it to tarnish.